Heat oven to 350°F. Spray 13x9-inch (3-quart) glass baking dish with nonstick cooking spray. In large saucepan, cook ravioli as directed on package. Drain; cover to keep warm. In same saucepan, heat oil over medium-high heat until hot. Add garlic; cook and stir about 1 minute. Add cooked ravioli and all remaining ingredients except cheese; stir gently to mix. Pour into sprayed baking dish. Sprinkle cheese over top. Bake at 350°F. 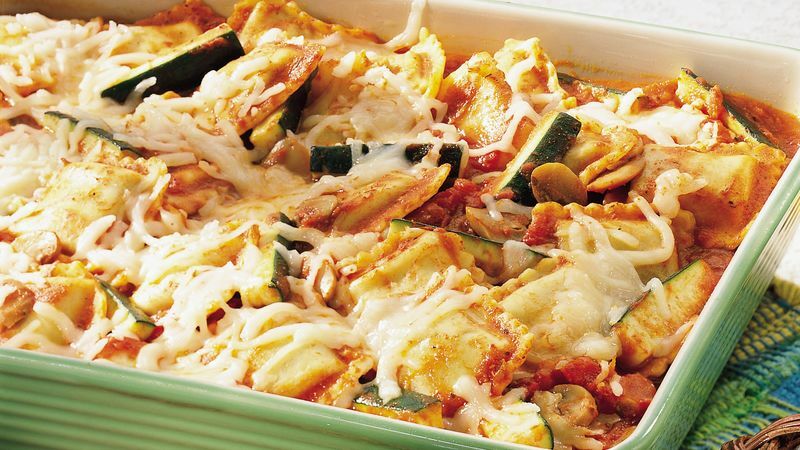 for 25 to 30 minutes or until casserole is bubbly and cheese is melted.